Preparative scale chromatography, whether it be prep HPLC or flash chromatography, contributes its fair share to this issue. I have previously blogged on using various techniques to reduce solvent consumption without sacrificing isolated product yield or purity. To me, step gradients are the best for minimizing solvent consumption. In fact, I have found experimentally that step gradients (developed from TLC data) increase a column’s loading capacity up to 2x over what a linear gradient can provide, while reducing solvent consumption by as much as 50%. This is significant – doubling load and halving solvent consumption actually creates a solvent savings of 4x. But if your flash system does not have the software to create the step gradient, what can you do? Well, you can consider changing flash columns. For a rather challenging purification a while ago, I looked at the impact of column media (silica particle size and surface area) on this sample’s purification. Choosing columns packed with smaller particles with higher surface area can really reduce solvent usage. In fact, these are two most important parameters regarding both loading capacity and separation efficiency. Using smaller particles gets you part of the way there, increasing load capacity up to about 40% (if you use media with 1/2 the particle size of what you normally would use). Increasing surface area allows a doubling (or even tripling) of loading capacity while improving separation efficiency. For really challenging purifications, this is an excellent approach. 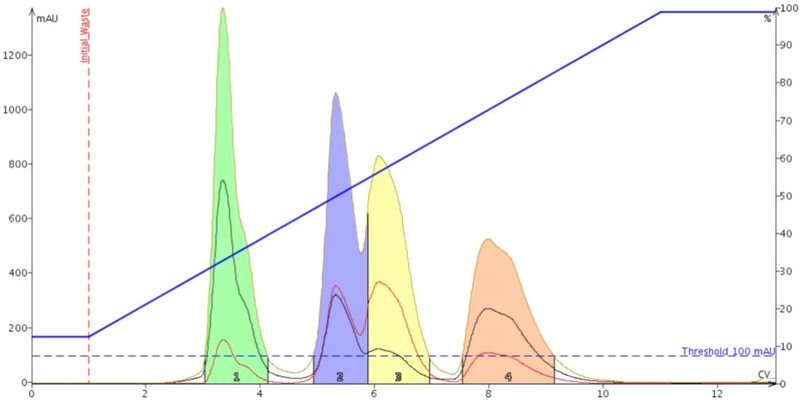 As an example, I purified a mixture of 4 pyrazines using a linear gradient of 12% to 100% ethyl acetate in hexanes with a 10 gram, 15-40 µm, high performance silica column (surface area ~500 m²/g) and also with a 10 gram, 25 µm, high performance column (surface area ~750 m²/g). The TLC data showed a relatively tight separation with ΔCV values of 0.25, 0.30, and 0.71, Table 1. Low ΔCV values indicate a small separation and therefore, small load. Even with as little a 20 mg, the column with 15-40 µm particles was unable to perform a complete separation of the middle two compounds, Figure 1. In order to perform this purification with the same media and method, a much larger column is required, likely a 50 gram column. Larger columns consume much more solvent – not efficient and certainly not green. In this case, the 10 gram column consumed 195 mL; the 50 gram would require 975 mL! Figure 1. A small particle silica column (15-40 µm) with standard surface area (~500 m²/g) does not have the capacity and resolving power to separate two of the four pyrazines even with a small 20 mg load. However, the high surface area column (a Biotage® SNAP Ultra), easily separates all four compounds at the same load, Figure 2. Consuming only 221 mL, the high surface silica column is much more efficient providing a complete separation with room for more than 20 mg of sample! Figure 2. Using a 25 µm, high surface area silica (~750 m²/g) provides a complete purification of the four pyrazines at the same 20 mg load. So, if you have a difficult purification and are environmentally conscious, I recommend using small particle, high surface are silica columns. Can you provide more information about your search for absorbance? your 10g, 25um column has a very impressive 750m2/ g surface area! I thought most of the disposable columns on sale today were about 500m2/g. Many years ago we used a flash silica with a 30A pore size and about 750m2/g surface area. It was very good but people noticed that compounds took longer to elute than expected. I guess that’s just because you get more chromatography per centimeter of column. The combination of smaller particle diameter and higher surface area really improves loading capacity and resolving power. Our silica has a 50A pore diameter, which is similar to traditional silica that has 60A pores. With the similar porosities, elution patterns are similar (selectivity as well). 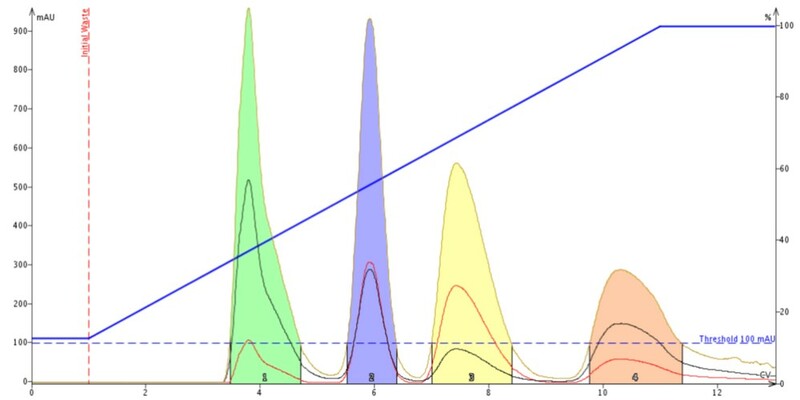 Previous Previous post: So, which detector should I use for flash column chromatography? Next Next post: How do particle size and flow rate affect normal-phase flash column chromatography?